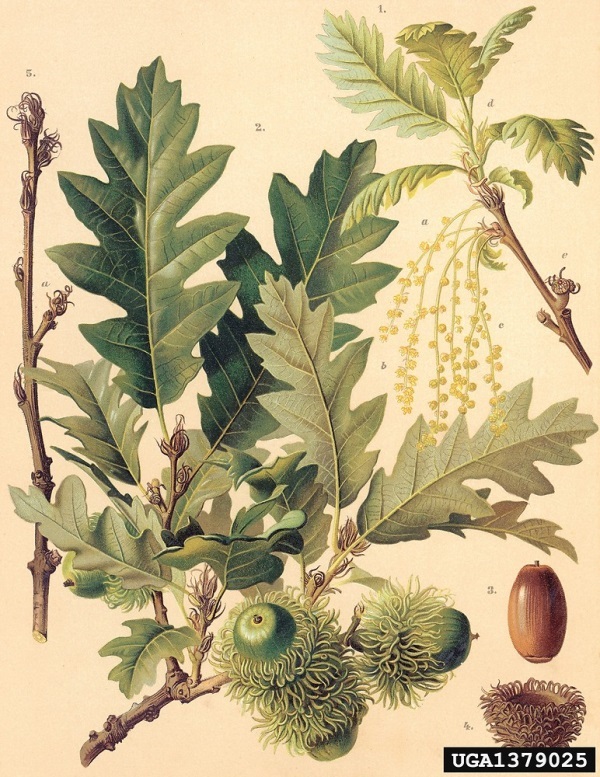 Quercus cerris.Zelimir Borzan. Copyright © 2014 CC BY-NC 3.0.Bugwood – www.bugwood.org.gobotany.newenglandwild.org. (Accessed 9/2014). Quercus cerris is a tree, red oak group, to 20 m tall, bark dark, with deep, rather regular, rectangular fissures. Leaves alternate, oblong, pinnately, lobed (coarsely saw-toothed), lobes bristle tipped; dark green above, hairy below. Fruit, acorns smooth, about 2.5 cm, with scales of cap elongated like very coarse, tangled hairs. Habitat: Locally escaped in Central Park. Other occurrences probably overgrown plantings.